Join us in honoring our dead, those whose love gifted us the possibility of living beyond survival, through music, food, and the ritual of altar building. During this season of Dia de los Muertos, guided by the varied and complex traditions specific to the region of Mexico, we will build a communal altar that reflects the intimate relationships, traditions, and wisdoms that have informed and enabled our struggles to live and love. We offer this space to celebrate, remember, and actively join the conversation of life. We invite everyone to bring an offering to contribute to this community altar: something that represents a loved one who has created space for you to live, or something that you hold sacred in your own life. Examples of items to bring include photos, flowers, food items, fallen leaves, a music album, candles, gardening tools, textiles, seashells, toys, books, seeds etc. Food, drink, and music are important offerings during Dia de los Muertos. As part of this celebration, free light appetizers will be provided by the Mercado la Paloma restaurants, including Azla Vegan, Chichen Itza, Al Pastor Taqueria Vista Hermosa, Oaxacalifornia, Burger Plaza Grill, and Thai Corner. 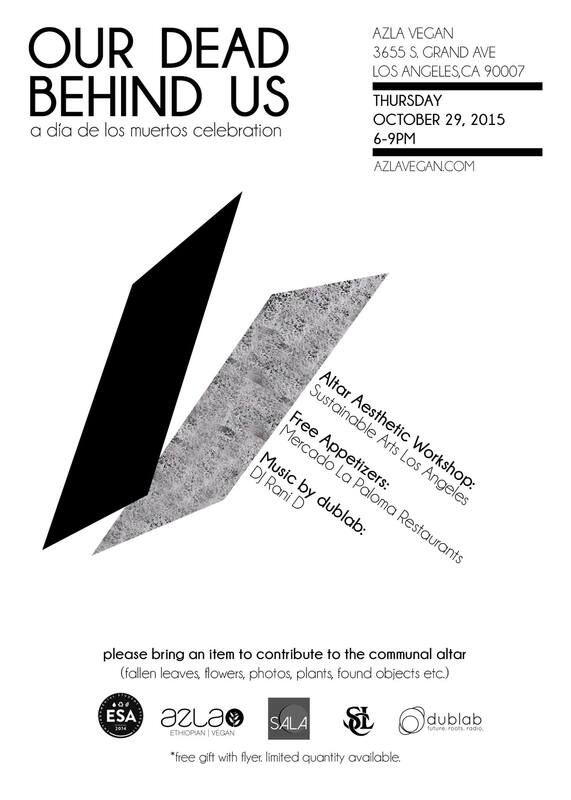 Special DJ set curated for this occasion by dublab DJ Rani D.
We honor our dead, and practice living together. Please join us. Presented by USC Environmental Student Assembly, dublab, Sustainable Arts Los Angeles, Southern California Library, and Azla Vegan. Azla Vegan is located inside the Mercado la Paloma. The Mercado is a few blocks from the University of Southern California, and across the street from the DMV. There is free parking on site. © 2015 Rani de Leon. All images are copyrighted by their respective authors.